In many sectors―especially in the mining and oil and gas (O&G) industries―fuel expense for generator operation represents a significant portion of total operating costs. As diesel prices have risen over the past few decades, companies that rely upon generators have sought cost-effective alternatives. Natural gas generators are affordable in the smaller size ranges, and the price of compressed natural gas (CNG) is still very attractive compared to diesel. Nevertheless, larger gas generators (over 30 kW) are more expensive than their diesel counterparts, and their life expectancy is shorter. This challenge, and the desire by existing diesel generator owners to find a lower-cost fuel alternative without purchasing a new generator, has led companies to clamor for a mechanism to run both CNG and diesel fuel in a single engine. Previously, the only way to achieve this goal was by making substantial modifications to the diesel engine itself―potentially including replacement of cylinder heads and pistons, and replacement or duplication of fuel injection systems. Consequently, these solutions were expensive and often unreliable. Furthermore, the modifications were permanent (without additional costly changes), possibly impacting value and future sale potential. In the past decade, aftermarket bi-fuel systems―which retrofit an existing diesel engine to burn CNG without requiring modifications to the underlying engine―have become increasingly affordable and reliable. Today, we believe the technology has reached a pinnacle, and we are confidently offering these solutions to our customers. With bi-fuel systems installed as after-market devices on new or existing generators, operators can substitute up to 70% of their diesel fuel with natural gas, realizing a reduction in fuel expense of as much as 50%. In this article, we’ll explore the technology and its implications for commercial and industrial generator users. Researchers have been experimenting with dual-fuel technologies (another term for bi-fuel) since the 1950s, mostly for use in on-road vehicles, trains, tractors and other propulsion-driven equipment. In the overseas markets, Bosch has been a leader in this technology, and in 2006 it began researching dual-fuel technology with mechanical diesel injection systems running CNG. In 2008, it expanded its efforts to include electronically controlled diesel injection systems. Since 2008, the technology has taken leaps and bounds, with several companies introducing add-on systems that can convert existing industrial engines to bi-fuel. This has been an important step, as it enables owners of existing generators and other equipment to utilize the solution. Furthermore, installation of the best of these systems does not result in any changes to the underlying OEM equipment. Operators―and even the engine itself, under emergency or failure conditions―can revert to burning diesel at any time without disabling or removing the device. On the environmental side, regulatory bodies have yet to fully embrace bi-fuel systems and give diesel engine operators credit for their use (to our knowledge). However, as discussed later in this article, two bi-fuel engines were certified by the Environmental Protection Agency (EPA) in 2013, a trend we expect to accelerate. What Is a Bi-Fuel Engine? A bi-fuel engine, as discussed here, is a traditional diesel engine outfitted (either during initial assembly or after production) with bi-fuel-capable hardware. A bi-fuel engine can operate either on 100 percent diesel fuel or a substitution mixture of diesel and CNG, but it cannot operate on CNG alone. Developers of bi-fuel systems have designed them so that engines equipped with this technology can deliver the same power density, torque curve and transient response as the diesel engine would, operating alone. In fact, the bi-fuel systems Worldwide Power Products (WPP) recommends to its clients have been demonstrated to deliver better performance―in certain operating environments―than the underlying diesel engine working traditionally. How Does a Bi-Fuel Engine Work? In a typical configuration, bi-fuel systems prompt the introduction of CNG into the diesel engine’s air intake system. (The precise gas flow to the engine depends on load and other operating conditions.) An air-gas mixture enters the engine upstream from the turbocharger and downstream from the engine air cleaner in a process called fumigation. The air-fuel mixture becomes compressed in the turbocharger and then enters each cylinder during the intake stroke. The intake valves deliver the fuel to the cylinders according to the normal valve timing of the engine, again with no modifications required. Near the end of the compression stroke of the piston, a small quantity of diesel fuel from the existing diesel fuel injection system enters the cylinder. (The bi-fuel system reduces the quantity of diesel fuel from that of normal operation based on the appropriate CNG-diesel ratio.) The diesel fuel ignites due to compression, which in turn ignites the air-CNG mixture, further accelerating the burn of the diesel fuel and producing combustion energy. Since a majority of the fuel has been premixed prior to activation of the diesel fuel injector, the resulting pressure rise in the cylinder is slightly steeper than normal diesel combustion. However, peak pressure in the cylinder remains within normal limits. Furthermore, the lean-burn operation of the engine, combined with the compression achieved by the turbocharger,ensures the system can supply power that is equivalent to that of the underlying diesel engine with the quantities of gas injected, even though CNG has a lower density than diesel fuel. The bi-fuel system utilizes the OEM air intake and diesel injection systems. So,although the bi-fuel controller determines the air-fuel ratio (to achieve a high level of fuel atomization with the smallest possible air restriction) and it facilitates and monitors the combustion process, it does not make or require any internal engine modifications to the diesel engine, itself. The control system also monitors a variety of engine parameters, such as manifold air pressure and exhaust gas temperature, allowing the system to determine when it should activate or deactivate bi-fuel operation based on load, ambient conditions,engine malfunction or other factors. To protect the engine from any possible harm, the default mode is 100% diesel operation. Flow of gas to the engine is load dependent and varies with combustion airflow changes. The bi-fuel system varies gas flow according to changes in engine vacuum level. The examples that follow are taken from one of the bi-fuel systems that WPP recommends to its clients. To avoid misleading readers, we have focused on the generalities of these components and not on any proprietary technologies offered by any particular manufacturer. 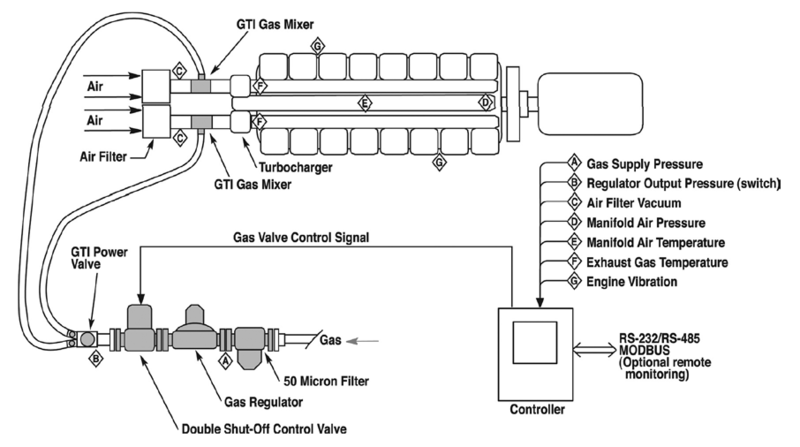 An air-fuel mixer of some type, where CNG mixes with the incoming air supply, is a crucial component of bi-fuel systems. After the mixing process is complete, the mixture moves on to the compression and combustion phases, so no further adjustment of the fuel mixture can be achieved. Rather, the engine’s natural air distribution system takes over for distribution of the mixture to each cylinder. The best of these solutions can utilize multiple mixers when needed for multiple air-intake systems―one mixer at each of the intakes. Some solutions may incorporate an air throttle plate, while others do not. The gas power valve is a needle-type valve that controls the maximum gas flow rate to the engine. In some systems, this valve is manually but not dynamically adjustable. In this case, the valve’s settings are usually established during the tuning phase of the engine conversion. After settings are established, the valve remains in a fixed position regardless of engine load. The CNG entering the engine must be conditioned and regulated. Most, if not all, solutions incorporate a fuelilter and regulator (either standalone or combined). These solutions should include both a manual shutoff valve and an automated emergenc y shutoff valve, both of which can stop gas flow in the event of an emergency or for system shutdown. Also present may be a demand-type gas pressure regulator that reduces gas pressure to zero (equal to atmospheric pressure) to allow the engine’s intake valve to “pull” the gas into the engine as needed. This allows the intake valve to adjust fuel volume as engine loads change. The control panel is the “brain” of the bi-fuel system and the alerting system for engine operators if problems occur. 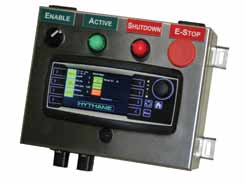 These panels monitor various pressure and temperature points and shift the engine to 100% diesel operation in the event that a parameter varies outside of acceptable ranges. These types of systems should be able to log each “out of range” event for diagnostic purposes. Some also track and record the number of operating hours in bi-fuel versus diesel mode. We’ve alluded to the “slam dunk” benefit of bi-fuel―fuel expense savings of up to 50% based on fuel cost differential alone. However, there are other, less-obvious yet quite valuable advantages to adopting this technology. Today, with increasing concerns about the noxious emissions of diesel, bi-fuel systems are becoming even more attractive. At the time of this writing, the EPA had not officially taken a stance on the use of bi-fuel systems with generators to help companies comply with NESHAP (National Environmental Standards for Hazardous Air Pollutants) mandates. However, the EPA certified its first bi-fuel engine in April 2013. The engine the EPA certified is the Wärtsilä 34DF, a marine engine. Furthermore, in November 2013, Landi Renzo USA announced that the EPA had certified a remanufactured S60 12.7L, Detroit Diesel engine. Per Landi Renzo USA, the engine achieves a reduction in particulate matter of up to 40%, CO2 reduction of up to 14% and smoke reduction of up to 50%. We expect that this statutory recognition will lead the EPA, within the next few years, to certify more engines. We are hopeful that any guidance from the EPA will include not only bi-fuel equipped, new models but also existing generator engines where a vendor or operator installs an aftermarket bi-fuel system. As pressure mounts concerning the negative environmental impacts of waste gas, e.g. flared gas from well-heads, bi-fuel systems provide a workable solution that turns waste into profit.Although waste fuel must usually be cleaned and scrubbed before incorporation into a bi-fuel system, this step is insignificant compared to the economic and environmental benefits companies derive by recapturing the otherwise wasted gas. The flexibility of burning gas or diesel fuel gives generator operators negotiating power with their fuel vendors. One example is the discounted rates that gas suppliers extend to customers that can work around supply interruptions without experiencing business difficulties. By reducing the amount of diesel fuel being used, operators gain longer run time for their fuel tanks (in direct proportion to the substitution rate). Although operators can leverage this benefit at any time, it becomes a vital differentiator during extended power outages by enabling operators to keep critical applications running longer. Operators using generators for prime or continuous use can recapture the cost of the bi-fuel system―including installation within a few months. Some manufacturers of these systems offer “recapture and savings” spreadsheets to help potential customers calculate their ROI. With a bi-fuel solution, operators can either extend the time between diesel tank refueling or reduce the size of their above ground tanks based upon revised demand projections. Gas-powered generators are more expensive to purchase than their diesel counterparts, yet gas is a more environmentally friendly and less expensive fuel. This paradox has plagued generator operators for years. With an affordable bi-fuel system in place, generator operators can now have the best of both worlds with minimal outlay and little to no additional complexity. In his current capacity as VP of Rental and Service, Scott Spidle oversees Worldwide Power Products’ rental fleet and the service team that supports it. With more than 18 years of experience in operations and management, Spidle has completed numerous projects where he successfully developed and implemented operating procedures. Worldwide Power Products specializes in sales, rental, service and maintenance of new and used power generation equipment including hurricane-preparedness, flat-fee generator rental programs.